Part of a cylindrical base of beige limestone (58 cm high x 46 cm diameter). 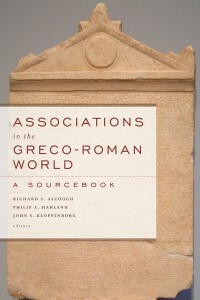 Roesch suggests that this association may be devoted to the poet Thamyris (hence θαμυριδδόντων = θαμυρίζοντες). However, Angelos Chaniotis rightly points out that the proper form for this would be Θαμυρισταί rather than θαμυρίζοντες (see EBGR , no. 142). Instead, Chaniotis suggests that this refers to a specific leadership function taken on by the two names that immediately follow (rather than a designation for the entire group). There were 22 members in this group. When Menandros was leader of the sacred rites (hierarchēs), the thamyrizers (thamyriddontes = thamyrizontes) were Pisandros and Damokles; the holy ones (hagiomenoi) were Smikrion, Kalliadaos, Aristolas, Pouthon, Hismeinodoros, Polykleitos, Boutheiros, Nakoudes, Aristolaos, Smikrion, Pisidikos, Plistias, Drekon, Ptoiotimos, Permichos, Echelaos, Mnasithios, Name. . ., Xenokritos. Μενάνδρω ἱα[ρ]αρχίοντος, | θαμυριδδόντων | Πισάνδρω, | Δαμοκλεῖος, || ἁγιομένων Σμικρίωνος, | Καλλιάδαο, Ἀριστολάϊος, | Πούθωνος, Ἱσμεινοδώρω, | Πολυκλείτω, Βουθείρω, | Ναυκουδῖος, Ἀριστολάω, || Σμικρίωνος, Πισιδίκω, | Πλιστίαο, Δρέκοντος, | Πτωϊοτίμω, Περμίχω, | Ἐχέλαο, Μνασιθίω, | ․․․․․ιος, Ξε̣ν̣οκ[ρί]τ̣ω. || vac.